How do I download my contacts? Posted: Thu Oct 13, 2011 2:56 pm Post subject: How do I download my contacts? I would like to backup my contacts on MJ to my computer. can anyone tell me how it's done? Posted: Thu Oct 13, 2011 3:09 pm Post subject: Re: How do I download my contacts? Go into "mymagicjack" via your soft-phone. Click on "my contacts", and then the "export" tab under the contact list section. Never used it, but I assume it works. I think the main problem is that there is no way to export them back to MJ, other than one-by-one entry, but since the list is kept on their servers, that may be a non-issue. Thanks for the info. I'll give it a try. 1.Got to "Control Panel" in Windows. Open up "Internet Options". 2. In there double click on "Internet Options" Click on the "Security Tab" Click on trusted sites and click the "Sites" button. 3. 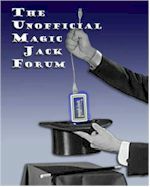 Add the following website: "https://data.magicjack.com" without quotes. 4. Then Uncheck the little box that says "Require server verification (https:) for all sites in this zone" Click "Close". 5. Now click on the "Advanced" tab. Scroll down to "Security" and uncheck the box that says "Check for server certificate revocation*" Click "Apply" and "Ok". 6. Now plug in your magicJack and check to see if your contacts are downloaded.